You will take the shoes of “Meta” ,a cyborg girl, in her quest to rescue her Creator “Dr Ray” from the hands of “General Creeper”, the evil leader of a rogue army!! 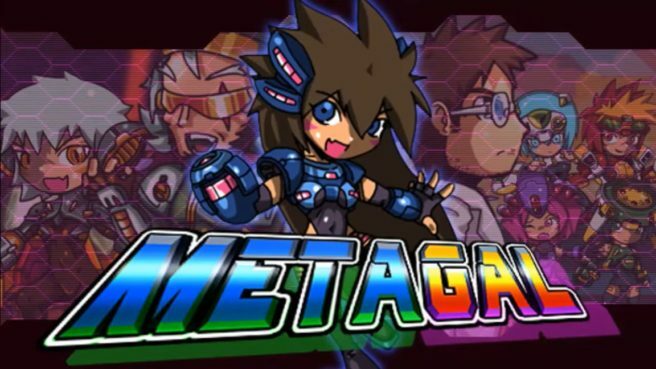 Also Metagal’s sisters, were kidnapped by Creeper: he turned them in battle cyborgs, in order to use their powers to rule the world!! Meta must face her sisters, free them, and copy their abilities. She must fight for 8 stages of intense action, and prepare herself for the final confrontation against Creeper himself! – 8 levels with unique environment,detailed design and different gimmick. – Defeat Gal No.# Boss and use their weapon. – Collect secret items to power up your character. – Controller and Keyboard customize support. – Finish the game once and play as Boss Characters each come with their own power and upgrade!